Are you ready for a whole lot of relaxing and plenty of camping memories? 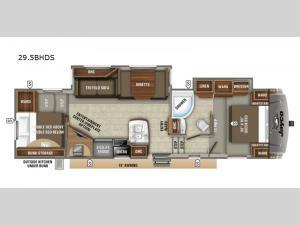 Well, come choose this double slide out Eagle HT 29.5BHDS fifth wheel by Jayco. This model can easily sleep ten people. 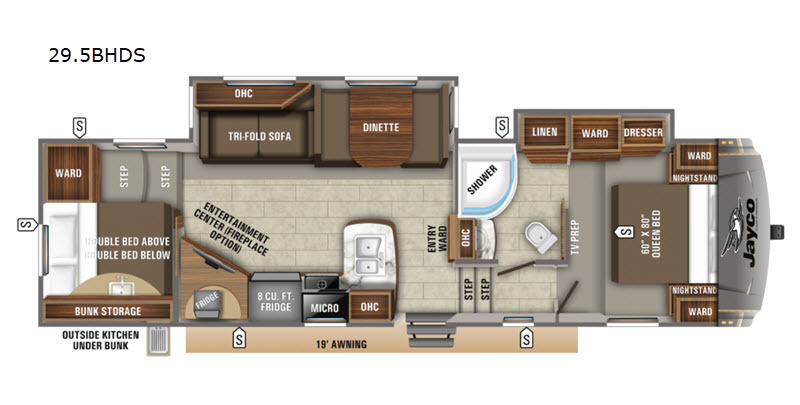 In the rear there is a bunkhouse with a set of double bunk beds, the slide out in the living area features a tri-fold sofa and a dinette which easily convert to additional sleeping space, and in the private front bedroom there is a queen bed. The hardest decision that you will have to make is where you will fix your meals - inside or outside. At the outside kitchen there is a sink and a pull-out two burner range. Also outside you will find a 19' electric awning with LED lights and plenty of storage areas for your extra camping gear and more!